On the morning of October 30th, the atmosphere around the Pecherskaya Lavra in Kyiv was tense. The ancient monastery, one of the most sacred sites of the Orthodox world, was ringed by police; the few pilgrims visiting were being made to pass through metal detectors, and all roads leading to the monastery were closed off. These security measures could only mean that the monastery was expecting a visit from President Viktor Yanukovych. The President, however, had not come here to meet the patients of the clinic of the Institute of Epidemiology and Infectious Diseases, the only place in Ukraine where people in the later stages of HIV/AIDS and hepatitis could find treatment. The clinic was officially closed, but the patients had been occupying the building for more than a month, in protest. No, the President had come to the monastery to bow to a relic of the martyred St George, brought to Kyiv hundreds of years ago from the Holy Mountain of Athos in Greece. Perhaps the President would offer up a prayer for the swelling ranks of present day martyrs, the victims of his government’s unwillingness to treat the living. Patients of the HIV/AIDS clinic at Pecharskaya Lavra explain how the closure of the clinic threatens their health and their lives. Five patients have already died since the eviction. St George and many other Ukrainians had first heard about the planned closure of the clinic in 2010, when Metropolitan Pavel, the Father Superior of the monastery, made an announcement on TV: ‘I find it unpleasant to be living next to people who have lived a dissolute life and got infected with all sorts of diseases while I spend my life in prayer and ask God for forgiveness.’ He also appeared in print, at once expressing his sincere Christian compassion for the suffering, and also revealing the church’s thinking on property matters: ‘How would you like it if there was a brothel in your tower block, right next to your apartment?’ Metropolitan Pavel’s love of worldly goods has already earned him the nickname of ‘Pasha the Merc’ – he has a particular weakness for a V8. His acquisitiveness also extends to government property, which has the misfortune to be situated close to his domain. St George and many other Ukrainians had first heard about the planned closure of the clinic in 2010. Like all good property owners, the Church made strenuous efforts to throw the unwelcome clinic off its property. 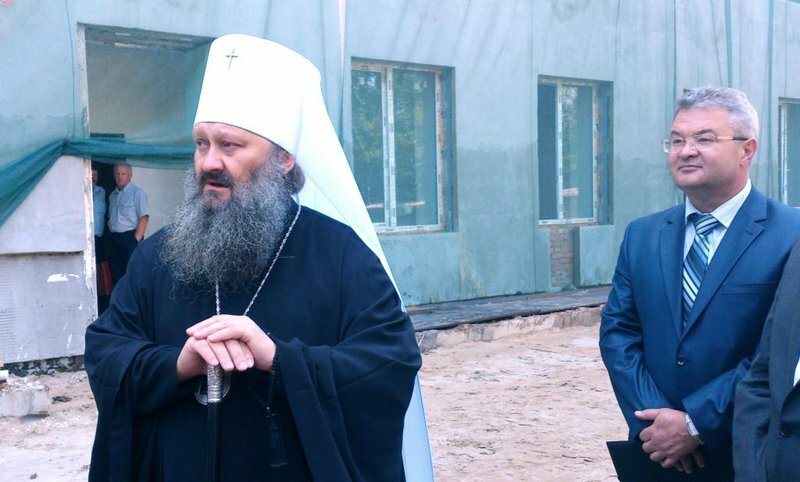 Soon after Victor Yanukovych came to power in 2010, Metropolitan Pavel took full use of the president’s close links with the leaders of the Moscow Patriarchate – to which the monastery belongs – and managed to acquire the land occupied by the clinic. At the time, the government promised to build new premises for the clinic, that would reflect the standards of its state-of –the-art medical facilities, mostly provided by foreign donors; but the construction of the new building has been much slower than the seizure by the Church of its old one. In the run up to the 1025th anniversary, in July 2013, of the conversion to Christianity of Kievan Rus (the medieval kingdom covering parts of modern Russia, Ukraine and Belarus), rumours began to circulate about the closure of the HIV/AIDS clinic in the summer, whether its new home was ready or not. This came to pass in August, when the facility was disbanded; its medical staff was forbidden to appear on the premises; its medicines were removed, and its many in-patients either sent home or transferred to a regional HIV/AIDS centre, which has neither the qualified staff nor the facilities to provide effective treatment. As a result, five people are known to have died in a single month; and that is the official figure. It is impossible to gauge the nationwide effect of the clinic’s closure – the clinic treated people from all over Ukraine – but many have been forced to return home. It is impossible to gauge the nationwide effect of the clinic’s closure – the clinic treated people from all over Ukraine – but many have been forced to return home. Some patients, however, have refused to accept the prospect of a slow death, as they wait for the new premises to open. Soon after the old clinic closed they occupied its buildings and announced that they would not leave until the new one was ready. The medical staff had been threatened with dismissal if they went anywhere near, but a few nurses were willing to help, and sympathetic local people brought food and medicines. In the middle of October, as the plight of the HIV/AIDS patients became a newsworthy item, Prime Minister Mikola Azarov ordered the Minister of Health to have the new clinic finished by October 28th. Yet, as that date approached, it became clear that even if the building work was finished on time it would still be impossible to open the clinic to patients because the Ukrainian Academy of Medical Sciences, which had been a loyal ally of the Church during this whole saga, had failed to complete the paperwork for the acquisition of the land where the new clinic stood; and without the paperwork it could not open. At this point, the patients resorted to a last desperate measure – they decided to squat in the new building, which was ready in practice but could not accept them in law. Patients resorted to a last desperate measure – they decided to squat in the new building, which was ready in practice but could not accept them in law. Back to St George: on the morning of 30th October, as top government members bowed before the relic of the long-suffering martyr, two minibuses filled with patients and their supporters made their way out of the monastery grounds, and left the old building for ever. The minibuses skirted round the security barriers and made their way to the other side of the city, where the new clinic for Epidemiology and Infectious Diseases stands. In the new clinic, equipped with the last word in technology, but without the medics to treat them until the land ownership issue is settled, patients have been taking the law into their own hands: they have occupied its empty wards, and are telling anyone in Ukraine needing hospital treatment for HIV or AIDS to come and join them indefinitely – there’s room for everyone. Nobody, however, can say when the patients might receive any treatment. On the site where the old clinic stood, Metropolitan Pavel is building a church, as well as a hospital for parishioners, without HIV/AIDS.